If you did not purchase your panel from the Utah Quilt Guild for the panel challenge for this year (see above), you will need to pay the $10 entry fee to participate. Only panels purchased directly from the UQG have the entry fee included in the price. Contact Josephine for more info. Make your hotel reservations for Quilt Fest 2019. The dates for Quilt Fest 2019 are Tuesday night September 17 to Saturday September 21, 2019.
in order to get the group discount rate ($99 per night). If you use the link (above), it will automatically give you the correct price. 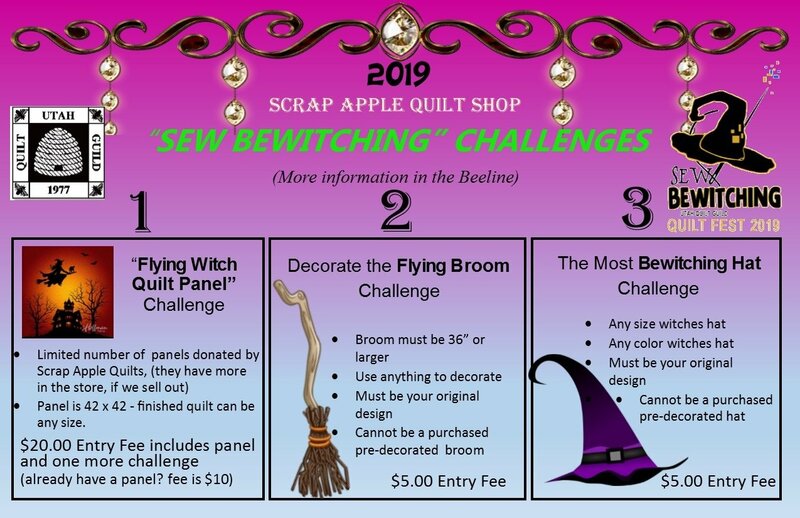 1 – Read the quilt show rules on in the 2019 Sew Bewitching Quilt Fest Brochure. 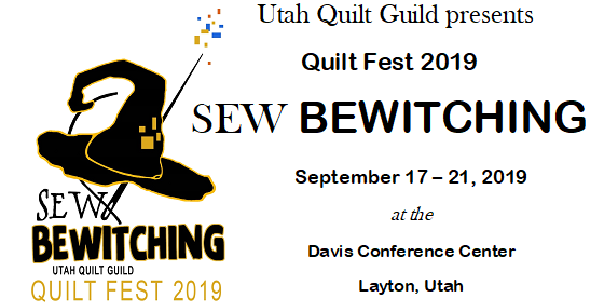 2 – Send your entry form to the utahquiltguild.org by August 15, 2019. If you are submitting electronically, print out your entry form. If you are using the form provided in the brochure, please make 2 copies of your entry form. Keep one copy for yourself and attach one copy to the back of your quilt. Note on the entry form if you will be delivering your quilt on Monday, September 16. We recognize some quilts will be coming from other shows, such as the State Fair, and we will be accepting quilts in the lobby at the Davis Conference Center between 3-5 pm on September 16. You must identify your quilt on your entry form as coming in during this time frame. 3 – Have your quilt completed with proper sleeve and label. Step by step instructions on how to make a sleeve below. 4 – When delivering your quilt, attach a copy of the entry form to the bag you are using to deliver your quilt. Fabric bags will be returned, plastic bags (preferred) will likely be replaced when the quilt is returned. 5. – Deliver your quilt(s) to selected shops before September 7, 2019 (Shops will be identified in the July and August Beeline) or you can mail or deliver you quilts by September 10 to : Louise Mudd, 1120 E 2550 N, Layton, UT 84040 If you are delivering in person, please call first (home 801-771-9379, cell 385-445-8500) If you are delivering the quilt to the Davis Conference Center on Monday, September 16, make sure that is identified on your entry form. Otherwise, late quilts will not be accepted. 1. Cut the sleeve 8½" wide times the exact width of your quilt. Fold the ends in twice (¼" and ¼" again) to finish each end of the sleeve. Stitch using a scant ¼" seam allowance. Press the long sides of the sleeve so they meet in the center. It helps to fold the sleeve in half lengthwise first and press to give you a center crease. When you press the sides to the center, you’ll press those creases out –they just give an easy guide without measuring or marking. 2. 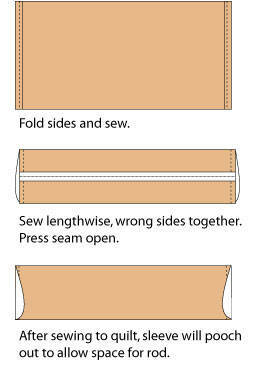 Fold right sides together and stitch ¼" seam on the long edge of the sleeve. Turn the sleeve right-side out. 3. You may need to repress the fold lines –you’ll need those for attaching the sleeve to your quilt. This is the step that provides the give needed in the sleeve. 4. Center the sleeve across the width of your quilt. The edge of the sleeve should lie just inside your binding on each side of the quilt. Using the fold, pin your sleeve in place ½" to ¾" from the top outside edge on the back of the quilt. 5. Pin the top of the sleeve along the fold and blindstitch in place. Use the opposite fold line to pin the bottom edge of the sleeve in place; blindstitch to the quilt. The sleeve will fit flat against the quilt from fold line to fold line; the rest of the sleeve will cup out giving enough play in the fabric to fit into the hanging device without damaging the sleeve. Miniature quilts are pinned on drapes and do not need to have a sleeve applied to the back of the quilt. 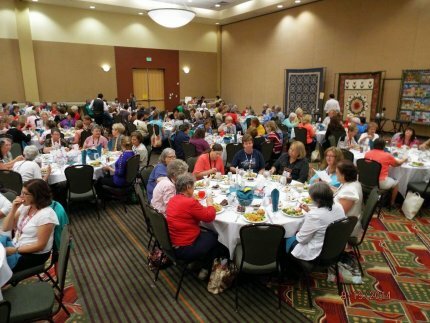 Want to sit with your quilting friends at out wonderful luncheon(s)? Be sure to make a group reservation. ALL SEATS ARE ASSIGNED. If you purchase a ticket, you will be assigned a table. To sit with your friends you must make a group reservation. You must have already purchased a luncheon ticket before making a table reservation. Please read all the instructions, the link for the form is below. Step 2 Gather information from your quilty friends. Step 4 Click Group Table Reservation. Step 5 For each person, you must enter first and last name, email address, special meal request (if any) and lunch date. Step 6 Be sure to mark any applicable boxes for a guest or dietary needs. Step 8 Check your email for confirmation. Step 1 Gather information from your quilty friends. Step 2 Contact Paula Dalby directly by sending an email to QuiltFestLunches@gmail.com. For each person, you must include first and last name, email address, special meal request (if any) and lunch date(s). **** You must register and pay for luncheon(s) to keep your reservation. All reservations are contingent on payment being received by Sept 6, 2019. **** Confirmations will be sent out Saturday, September 14, 2019, via email. **** Each person in the group will receive his/her own email confirmation. **** Special Meal requests MUST be submitted by September 2, 2019. Tickets purchased after this date are for the standard meal. For more information see the Quilt Fest Brochure.